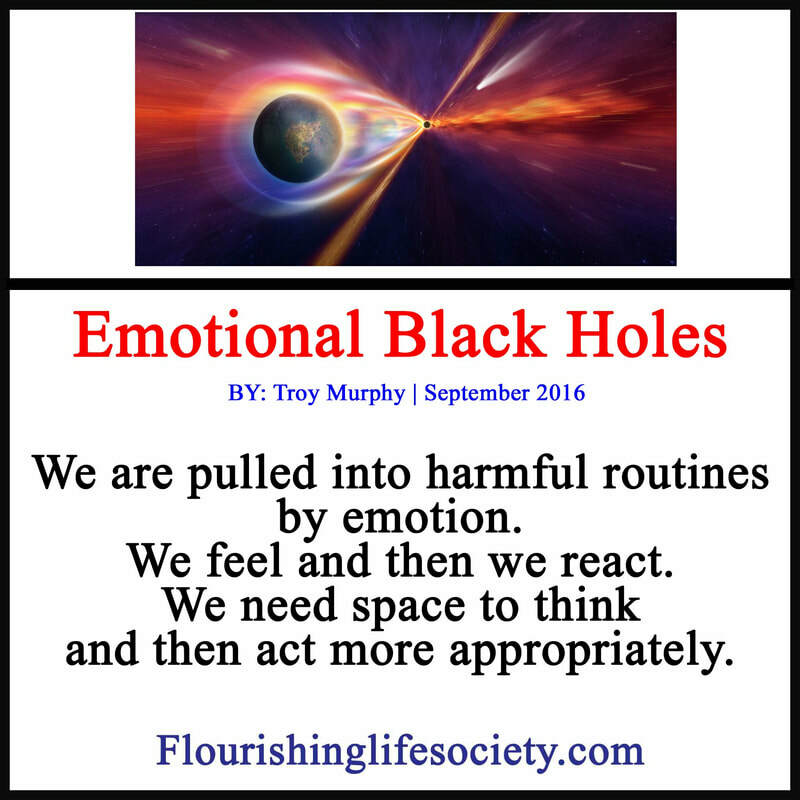 We are pulled into harmful routines by emotion. We feel and then we react. Unfortunately, our reaction isn't always helpful. We need space to think and then act more appropriately. Self-justification—we all do it. Being wrong scares us; we ignore blatant evidence when it conflicts with beliefs but cite fragments of ambiguous information when it supports. Five traffic tickets and a few accidents doesn’t shake our conviction of superior driving skills—yet we readily point to the inferior maneuvers of the maniacs that challenge our skills. Several failed relationships don’t give us pause to consider personal deficits in connecting with others but a flimsy long-distance relationship single stands as irrefutable evidence of our lovability. We are biased, hopelessly driven by emotion, and blinded by self-importance. We feel, we interpret, and then are sucked into the emotional black holes of stupidity, refusing logic, and rejecting correction—because it’s not our fault. Once we hold an image of self, we overlook opposing evidence. Thought, especially about personal traits, is always skewed by biases. We skim over obvious shortcomings while actively seeking obscure evidence to disprove the blatant. When beliefs are challenged, we feel discomfort because the foundations we use to predict futures is shaken. We can take a deeper look at the belief or discredit the contradictory information—an articulable discredit soothes the discomfort. Our mental gyrations aren’t an exact science. Explainable Reasons for events aren’t obvious. Most happenings are a freak combination of many causes. A failed marriage isn’t because we lied, or even cheated, but a bundle of subtle and not subtle contributing causes. By rationalizing responsibility, solely pointing an accusing finger to outside sources, we shift culpability, freeing ourselves from guilt and limiting perceptive control over our lives. However, by accepting responsibility for the relationship troubles, we are more likely to discover effective actions we could take to keep the romance burning. "By rationalizing responsibility, solely pointing an accusing finger to outside sources, we shift culpability, freeing ourselves from guilt and limiting perceptive control over our lives." We become the obstacle to improvement when we constrain helpful information, limiting ourselves only to pleasant evidence. We are sucked into the emotional pleasing vortex. It’s not all our fault, of course. Others play a role; we don’t exist on an isolated island. We live together with others and their actions trigger feelings—pleasant and unpleasant. We can acknowledge their involvement in our experience. The error that impedes is when we blame others as the sole cause of our pain. With this limiting view, others frustrate our plans when they don’t cooperate with our narrowly conceived ideals; we forget our goals are not their goals. Circumstances and others don’t march to our beat. They shouldn’t have to. Others have their own passions, goals and hopes—that sometime match ours; but sometimes don’t. An intimate partner should be supportive but not at the cost of their own individuality. In healthy relationships, the individual lives play in parallel, sometimes in unison, sometimes in toleration, other times through negotiated agreements. This is a tall order for the emotionally immature not fully aware of the dynamics of a relationship. When differences spark discomfort, we must look a little deeper, not blindly sucked into the immediate emotional reaction. Is our partner selfish, or are we expressing selfishness, expecting a partner to be a puppet to our emotions? Finding a partner’s character flaws is simple—all partners have a few (many). If we habitually blame, finding a cause from the obvious collection of faults is easy. Blaming allows us to side step the dynamics and complexity of getting along, and relieving guilt with a default cause—the partner’s annoying imperfectness. When our ego demands bolstering by pointing to a partner’s flaw, the relationship is doomed. The blamed partner eventually tires of being the villain and responds protectively by being timid or defensive. Unless we challenge the powerful pull of misguided emotions, the faulty expectations on partners to please our chaotic emotions and bitter accusations, will destroy closeness, magnifying issues, spiking insecurities, and ruining lives. Pointing out flaws doesn’t work. Instead of building a relationship, the focus is transforming a partner to not trigger feeling. It doesn’t work. Partner’s recoil from exploiting of their insufficiency; they respond defensively returning bitter attacks or protectively closing their hearts. Poorly worded, poorly timed advice isn’t embraced with gratitude. Mercilessly attacking character hurts and needs to stop. Next heated encounter, when you feel yourself being pulled into the gravitational influence of emotion, slow down, recognize this trap, identify the urge to blame, and raise a warning flag and call time out. As we acquaint ourselves to our emotional vulnerabilities, the moments of discomfort are not black holes of disaster, sucking us into destructive behaviors but portals to deeper insights, exposing personal traits and patterns in need of examination and adjustment.